The leaves are falling, and it's just a few short weeks (days?) before snows blanket all the backcountry singletrack that has defined running life the past six months -- which is one way of saying time is short to really stress test some new shoes before the dark, cold days of winter. One such shoe I've really been putting through the paces this late season is Inov-8's Roclite 320 (retail $94.95). 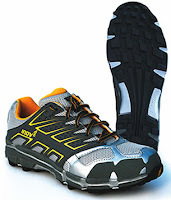 Inov-8 is a UK-based company that has made its name producing stripped down, responsive mountain-running shoes with aggrevise soles and low profiles. Lacing up a pair of their light trail shoes (like the Flyroc 310 or the Mudroc 280) requires a bit of re-education of expectations. They don't strike the ground like most people are used to and can be a rough ride at first, leaving you with sore ankles and knees, but those who can work past such things are rewarded with a nimble shoe that can descend like no other. Admittedly, though, these stripped down flyers aren't for everyone, especially those who find themselves running a mix of trails and roads. And it is for these folks that Inov-8 seems to have developed the Roclite 320. If the Asics Gel Nimbus and the Inov-8 Mudclaw 280 married and had a child, this shoe would be it. While it has the extra cushioning and substance of a fairly chunky road shoe, the Roclite 320 maintains the Inov-8 lightness as well as the aggressive sole and low profile that make ready work of rocky trails and gnarly descents. The solid toe bump protection of the 320's is extra gravy, especially for those of us who make a habit of jamming our toes into any and all manner of rocks on the trail. The major drawback of these shoes is the stiffness. Although the sole is pretty much the same as those used on the lighter, very flexible Inov-8's, when it's integrated into this beefier incarnation it gets a tad inflexible. This makes them not quite as responsive, and not quite as fun, as they could be. And I found on very steep downhills the stiffness made my feet slosh forward more than normal, even after repeated tweaks to the lacing. One minor (and purely cosmetic) drawback of the 320's is that they lack that inimitable Inov-8 style. While they certainly aren't ugly shoes, they don't have that engaging, new paradigm look of the rest of the line. The bottom line: If you're looking for a light, responsive trail running shoe that is great on descents and can do some comfortable road miles, give the Roclite 320's a try.